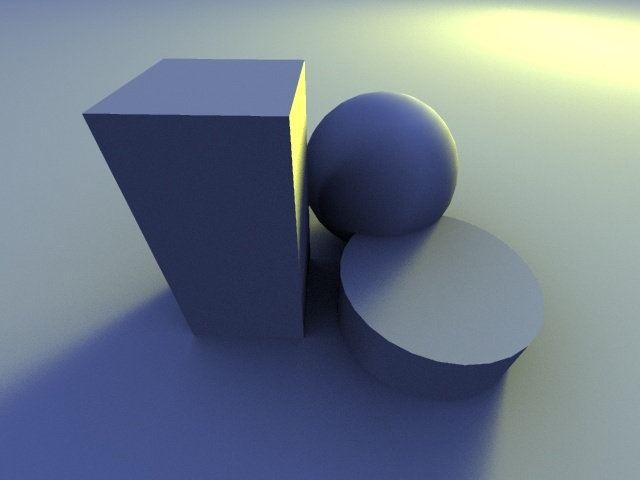 This is a render from the raytracer that I am working on, written in C++. It shows some of the features I have implemented so far: triangle-rendering, a skylight, a triangle-light, smooth shading, adaptive anti-aliasing and shadows. Lots of other features have been implemented as well. My renderer is a monte-carlo renderer: skylights, secondary illumination (though not turned on in this pic), glossy reflections and triangle lights are traced backwards into the scene. It does all sorts of texturing as well, all map-controlled. One thing I have not yet worked on is real optimalizations. I am doing bounding objects now, but I want to make that better with a hierachy of axis aligned bounding boxes. After that the great thing to do would be adaptive undersampling in object space, but that is still far off. As some exporter for some modeller has not yet been written, all the renders are kinda boring. I am planning on building an exporter for Blender, when the time comes.